GUILD OF MASTER CRAFTSMEN Joints: A Woodworker's Guide takes one of the most important and challenging aspects of woodworking and demystifies the all-important subject of choosing, designing and cutting woodworking joints. Strong, appropriate and well-fitting joints are one of the hallmarks of the skilled woodworker. Making them properly and accurately calls for good planning and marking out as well as a good degree of care in the cutting, fitting and final assembly. It is essential to approach making joints methodically, this book provides all the necessary information to ensure success. •Aimed at both those new to woodworking as well as the experienced woodworker • Joints: A Woodworker's Guide is broken down into three main sections: planning and preparation, basic techniques of joint making and individual joints in detail. •Areas covered include: planning the work and preparing the wood; measuring and marking; cutting and fitting, glues and assembly. Master box maker Doug Stowe guides woodworkers every step of the way in creating 10 gorgeous yet useful Tiny Boxes. Boxes are always a hit with woodworkers because they are quick to build, use a minimal amount of material, don’t require a large workshop, and make great gifts. Each project teaches a new technique so you will improve your general woodworking skills as you create boxes like the inlaid sliding pocket box and Japanese puzzle box. In this all-new collection of boxes from one of America's premier box makers, Doug Stowe shows how to design and build ten tiny boxes, including an inlaid sawn box, a box made with hand tools, and a finger jointed box with dovetails. ll woodworkers worth their sawdust know that joinery--good, bad, or indifferent--tells the unvarnished truth. How well a piece is made and how skilled the maker is. As a result, joinery is always a hot, and sometimes controversial, topic because even the masters will agree that there is no one right way to do it. Over the decades, no one has proven better at teaching readers how to make beautiful, enduring joinery than Fine Woodworking. This comprehensive and practical book demystifies the all-important subject of choosing, designing, and cutting woodworking joints. It's packed with insightful information and tricks of the trade that will advance the work of novices and seasoned craftsmen alike. Because whatever your skill level, there's always room for improvement when it comes to joinery. A quick and easy way to do more woodworking. Pocket hole joinery techniques simplify woodworking. For beginners and master craftsmen, the pocket hole joiner has become a favorite woodworking technique because it is easy to master and the tooling guarantees a strong joint every time. Pocket Hole Joinery is a must-read for beginner woodworkers and DIYers. 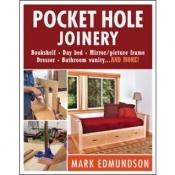 Learn to use pocket hole joinery with step-by-step instructions and over 275 photographs and illustrations. And, you will also learn how to quickly and easily build durable cabinets and furniture. Learn from an expert! Author Mark Edmundson trained at the renowned College of the Redwoods Fine Woodworking Program. He is a teacher in Sandpoint, Idaho, and has been building furniture and cabinets professionally since 1998. As an educator, Edmundson understands the importance of mastering the basics.